Maria Kochetkova and Joan Boada in Tomasson's Romeo & Juliet. © Erik Tomasson. How easy to become thoroughly jaded by the ubiquitous story of doomed lovers. From a 14thcentury Veronese legend to Shakespeare’s play to West Side Story, the tale of Romeo and Juliet is completely interwoven in Western culture. Operas by Bellini and Gounod, symphonic poems by Berlioz and Tchaikovsky, and Bernstein’s Broadway musical are all part of the terrain of hundreds of artistic endeavors based on the same story. Choreographers MacMillan, Ashton, Béjart, Cranko and Robbins created their own dance dramas of this timeless tragedy. And yet, with Prokofiev’s magnificent ballet score, all my weariness drops away. I am but a Pavlovian dog on hearing the opening bars of the overture – my heart races in anticipation and my throat tightens to stave off the tears. 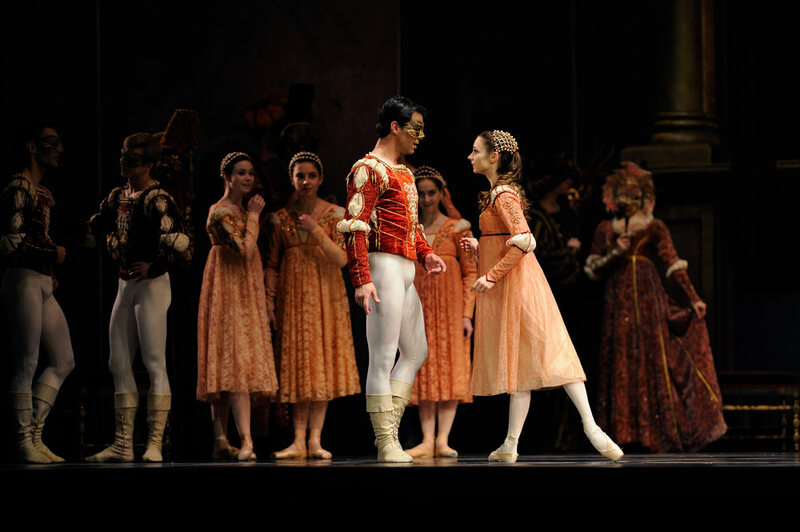 It was no different this past Saturday (3/10/12) as Martin West conjured those notes with his baton from the San Francisco Ballet orchestra before the curtain rose on Artistic Director Helgi Tomasson’s version of Romeo and Juliet at the War Memorial Opera House. I had just seen the lead couple, Maria Kochetkova and Joan Boada, dance luminously a few weeks before in Yuri Possokhov’s Francesca da Rimini and this performance offered even more to savour. San Francisco Ballet has had and still has some lovely ballerinas and terrific male partners, but true partnerships are harder to come by in these times of rapid mix and match. Gone are the days of Fonteyn and Nureyev, Sibley and Dowell, Seymour and Gable, Fracci and Bruhn, Maximova and Vasiliev, Danilova and Franklin. While Kochetkova and Boada can never make the all-time great partnership list because the concept has gone out of fashion, they indeed have all the necessary qualities of musicality, line, and emotional depth that produce a rare ineffable chemistry. The very petite Kochetkova made an ideal Juliet, by turns fresh, innocent, affectionate, defiant, impassioned and grief-stricken. Though she had clearly drawn the trajectory of her character’s development from innocent young teen to young woman in love, she maintained a spontaneity that allowed her to respond to everyone around her without affectation. The boyishly charming Boada also kept his interpretation convincing as he rapidly matured. When dancing together they were simultaneously individuals and one being. Their technical assurance meant that there were no missteps that couldn’t be artistically smoothed, no brittle landings from lifts, no hesitations in the most difficult partnering. Their intense emotional rapport, both joyous and then desperate, yielded only seamless storytelling, with no line dividing dance from narrative. Unfortunately, most of the corps de ballet needed a firmer directorial hand with the mime and creating character. They looked like they were marking instead of performing in the crowd scenes and lacked a sense of historical authenticity. Tybalt, danced by Daniel Deivison, belonged to the 20th century, and though, to his credit, he has a very strong presence and technique, he could have used some guidance, too . A handful of outstanding performers helped draw attention away from the shortcomings mentioned, but the tepid, and at times unmusical, choreography was a burden that the entire company had to share and work all the harder to overcome. Pauli Magierek’s Lady Capulet was one of the most nuanced and clear portrayals I’ve ever seen. Her regal elegance so befitting, yet her subtle intimations of her relationship with Tybalt are a subversive foil that underlines her hysterical grief over his death. Ricardo Bustamante was not the usually contemplative Friar Laurence, instead he was energetically involved in helping the ill-fated couple. He would have been better cast for this performance as Lord Capulet, a role he does to perfection. Both Gennadi Nedvigin as Mercutio and Jaime Garcia Castillo as Benvolio lit up the stage with their pyrotechnics, especially in the Masks trio with Romeo before they enter the ball. Kochetkova and Boada were so transcendent that even this microscope-eyed critic could soar with them beyond the less than ideal frame of Tomasson’s version. The writer’s depth of experience and straightforward style makes for a rewarding read. An excellent review. I look forward to reading more from Aimee Tsao. Thank you. So happy to read news from San Francisco. Hope to see more wonderful reports from Aimee Tsao. Haven’t seen the SF Ballet production being reviewed, but this incisive review brings to mind the Jean-Christophe Maillot-choreographed production mounted by Pacific Northwest Ballet/Seattle in 2009, which presaged a few of the attributes of Tommason’s version mentioned here: the burning trajectory of youthful innocence to young love’s spiritual and physical eroticism; the dynamic spatial meshing of the principal couple’s bodies and beings; the subtext relating Friar Laurence’s surpressed sexual energy to that of the Romeo & Juliette; and the intimation of Lady Capulet’s amorous projections upon (or entanglement with) Tybalt. Hot stuff in the classical realm! Thanks for the lush but not gushy review ok Romeo and Juliet. It showed a real knowledge of the company’s strengths and less-than-strengths. Lovely review. Wish I was there to see the performance. Aimee’s writing brought it to life. Thanks for publishing an insightful review. Thank you for sharing a thorough review. Your pen’s honesty is so refreshing. Waiting for more! It’s wonderful to read, engaging and thought provoking while remaining objective. Aimee Tsao’s review is a marvelous balance between a highly personal response to Prokofiev’s score for the ballet and a deeply informed, objective appreciation of this particular production. I might have liked a bit more technical analysis of the choreography and dancing than she provides but she certainly conjures a vivid sense of this performance. More from Ms. Tsao, please! Your piece makes me long to get back to the ballet! Aimee Tsao’s review allowed me to take part when I could not be there. Very well written. and artful form of movement. genius was 10% inspiration and 90% sweat. Let’s all dance some more.